Turkish Turkcell Super League continues with 4 games on Saturday. The most important game of the week was played on Saturday between the leaders Sivasspor and the championship hopeful Fenerbahce in İstanbul. With this win Sivasspor still on top with 45 points but, lost big ground in the race!.. If the second place Trabzonspor win the match in Antalya on Sunday they could share the top spot with Sivasspor again!.. On the other hand, Fenerbahce with this win came to life, again!.. Fenerbahce goes over Galatasaray in the standings with 40 points!.. Galatasaray who has 37 points wil play against Konyaspor in a way match!.. Giray Bulak, coach of the Konyaspor, always plays though against Galatasaray!.. Tuncay Sanli struck for the second time in four days as Middlesbrough dealt Liverpool's Barclays Premier League title hopes a fatal blow with a 2-0 win. The Turkish international sealed Boro's first league win in 15 attempts with a well-taken 63rd-minute effort after Xabi Alonso's own goal 14 minutes before the break had given Gareth Southgate's men a platform. The Reds, who defeated Real Madrid on their own turf in midweek, were a shadow of the side which triumphed at the Bernabeu Stadium, although Nabil El Zhar and Dirk Kuyt passed up glorious opportunities. Gary O'Neil forced a good reaction save from Jose Reina from Stewart Downing's 11th-minute cross. Opposite number Brad Jones had already kept out close-range efforts from Nabil El Zhar and Dirk Kuyt. When the opening goal finally arrived it came at the other end. Alonso instinctively stuck stuck out a leg as Downing's 31st-minute corner sped across the six-yard box but only succeeded in diverting the ball past the helpless Reina. Boro might have extended their lead four minutes before the break when Downing robbed full-back Martin Skrtel and forced Reina into a good save. Liverpool should have been back on level terms within three minutes of the restart when Steven Gerrard ghosted into the box and pulled the ball back invitingly for El Zhar who hammered his shot over the bar. The second goal came with 63 minutes gone. O'Neil slid the ball into the path of Jeremie Aliadiere down the right and when he squared for Tuncay, he guided his shot past Reina into the bottom corner. Brad Jones saved from Gerrard and Kuyt failed to connect with his skipper's cross with the goal begging as the game slipped further from Liverpool's grasp. Downing and Tuncay combined to open up the Reds once again and present Marlon King with a glorious opportunity but Reina made a two-handed save. IN The Turkish Super League opening match of the week 22, Besiktas won in the last minutes of the match again on Friday. In Istanbul in front of rowdy Besiktas home fans Besiktas beat Istanbul BUyuksehir Belediyespor 2-1 in the last minute of the match. In the 80th minute Rodrigo Tello scored the matches first goal four minute later Sehat Gulpinar made it 1-1 match for Istnabul B.B , than in the last mint es of the match defender Gokhan Zan made it 2-1 for Besiktas. Besiktas is only three points behind the top team Sivasspor and Sivasspor will have a real test on Saturday in Istanbul against Fenerbahce. On the other hand Trabzonspor will be away against a though team Antalyaspor. Sabri Sarioglu slammed home a last-minute winner to earn Galatasaray a place in the last 16 of the UEFA Cup at the expense of Bordeaux. Galatasaray looked like they were going out on away goals when Bordeaux scored twice in the space of a minute, through Marouane Chamakh and Fernando Cavenaghi, to draw level at 3-3 with a quarter of an hour remaining. But Turkey full-back Sabri smashed a low 20-yard shot into the corner with seconds remaining to settle an amazing end-to-end tie. The game had started at breakneck speed, David Bellion opening the scoring after just 11 seconds for Les Girondins, but Gala recovered superbly and goals by Arda Turan (two) and Harry Kewell saw them take the whip hand. It was a sensational way for new coach Bulent Korkmaz to begin his spell in charge of Galatasaray, but his reign could hardly have got off to a worse start. From the kick-off, the ball was played back to Diego Placente, who hoofed a long clearance upfield. The ball slid past Fernando Meira, allowing Bellion to race onto it and slip a low finish past the advancing Morgan De Sanctis. Fortune was not favouring Korkmaz - in the 12th minute, Bordeaux centre-back Souleymane Diawara hooked a cross from Arda onto his own bar and soon after, Galatasaray's key midfielder Mehmet Topal trudged off with a hand injury. The tide turned in the space of three minutes at the end of the half. Turan equalised in the 42nd minute when he ran onto Milan Baros' lay-off and lashed home a shot from 15 yards. The home crowd were still celebrating when Kewell, who had come on as a substitute for Topal, picked up a ball 25 yards out and smashed an unstoppable shot into the top corner. Galatasaray took control of the match thereafter and Lincoln sidefooted wide from six yards with the goal at his mercy on the hour mark. The tricky forward made amends in the 65th minute, cutting in from the left and crossing for Arda to tap in from two yards. The match looked over but Chamakh reduced the deficit in the 74th minute by running onto Cavenaghi's cute through-ball and sidefooting home. Barely a minute later, De Sanctis dropped a cross and in the ensuing scramble, the ball fell at the feet of Cavenaghi, who had the simple task of tapping into an empty net. But there was a final twist in the tail when Sabri scored a terrific winner after Bordeaux only weakly cleared a corner. Bulent 'The Soldier' Uygun has led the club up the league. The historical hierarchy of Turkish football has rarely been called into question, but this season something has changed. Sivasspor's humiliation of the reigning champions Galatasaray in their recent cup games and a meteoric rise to the top of league suggests that, unexpectedly, they could become only the fifth club ever to win the Super Lig title. While Besiktas (in the early 90s) and Trabzonspor (in the late 70s/early 80s) have offered resistance to the dominance of Galatasaray and Fenerbahçe in the past, 2008/09 has seen a new force arrive in the championship race. In the top flight since 2005, Sivasspor have not simply sprung out of nowhere, having finished 3rd in last year's campaign, but the scale of their rise has surprised many. Some dominant home form at the beginning of the season - where they have won ten of their eleven games thus far, conceding just four goals - is the key. They have made a name for themselves, not by playing the best football, but forging a winning mentality. A number of clubs have given notice of their potential in the past, threatening to cause an upset in the title chase, but have often been found wanting towards the end of the season. Sivasspor, simply by virtue of their fighting attitude, appear different and could be set to destroy the established Turkish order if they can hold out until May. As unfashionable as they are, no-one can query the standard of Sivas' performances this season. Backed by a hostile home environment which sees opponents arrive to face -10°C temperatures (up to -20°C if you include wind-chill factor), they rely on speedy counter-attacking and a strong desire to battle hard. A philosophy which has already seen them upset both Galatasaray and Fenerbahçe at home this season. Pulling the strings is former Fenerbahçe captain Bulent 'The Soldier' Uygun, who was famous for his 'soldier salute' goal celebration during his playing days and began his sporting career as a wrestler. The 36-year-old manager claims to have learnt from Carlos Alberto Parreira, the Brazilian manager who masterminded his country's uncharacteristic 1994 World Cup triumph and managed Fener in 1995/96. Uygun has turned the club into genuine title contenders. Still learning his trade, Uygun took over in early 2007 with the club rooted to the bottom of the league and led them to 7th place. He then won the 2007/08 Manager of the Year award for getting the club to 3rd position the following season and has instilled a corinthian spirit into his squad, with teamwork the priority. He has a tightly knit group of players with which to work and is backed by a strong boardroom, led by President Mecnun Odyakmaz who has said in the past: "Money is not a major concern. We are a brotherhood." It's a good thing that money isn't important, because Sivasspor are not blessed financially. Already suffering from the fact that Turkish television only shows matches featuring the big four (Besiktas, Fener, Galatasaray and Trabzon), the club have been built on a platform of mediocrity, not wealth. Picking up players deemed not good enough for the bigger teams, Sivas have recruited well, but without spending a vast amount of money. Their squad looks average in terms of talent, but that has been to their benefit when it comes to keeping their best performing players. Announcing that they were willing to listen to offers for star Mehmet Yildiz recently, the club were unable to raise any interest and Yildiz has gone on to net 11 goals in 19 starts in propelling the club to the top of the league. In January, Mahmut Hanefi and Onur Tuncer joined from Fener and, with no real stars in the squad, Sivas are able to focus their attentions on their football. Israeli striker Pini Balili has returned from injury, French import Yannick Kamanan has impressed when given the chance and the club are riding on a wave of confidence in a bid to overcome the odds and finish strongly. Balili recently wore a t-shirt with the words: ''Nothing happens through coincidence'' imprinted on it, while celebrating his side's Turkish cup win over Galatasaray, and he may be right. The league table cannot be argued with and, while these underdogs continue to improve, it is the reigning champions who have been hit hardest by their rise. ''It's high time we come to terms with the reality of Sivas,'' said Galatasaray keeper Aykut Erçetin after his team's cup defeat. But they haven't and even parted company with German coach Michael Skibbe last week, replacing him with 40-year-old club icon Bulent Korkmaz. The upheaval surrounding the appointment - reports in Turkey had suggested that the club had offered the job to Gheorghe Hagi, only to be rejected - may hurt the champions in the short-term but it was necessary as the Turkish giants had failed to monitor the rise of the Anatolian club. Something had to change. Two defeats and one draw against them in an 11-day period at the end of January set the wheels in motion, although the last straw came from a humiliating 5-2 defeat by minnows Kocaelispor at the 'Lions Den' a month later. 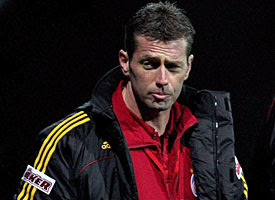 Skibbe was sacked as Galatasaray boss after a poor run. While Skibbe admitted blame for Galatasaray's freefall, claiming that he was ''unable to establish a solid defensive formation,'' his position cannot have been helped by the mountain of praise being heaped on Sivas. Fifth in the league and eight points behind the surprise leaders, Galatasaray fans expect better after a history of success, although some will tip their hats to Uygun's men for what they have achieved already. Many in the Turkish media have dismissed Uygun's side as another flash in the pan and backed Galatasaray to come back strongly, but only the second half of the season will determine whether or not Sivas can complete their meteoric rise by winning the title. The general feeling is that they will fall away, as Vestel Manisaspor did in 2006/07, but there is also an increasing acknowledgement that this might be the year things change. Sivas can begin to win over the critics with a win over Fenerbahce at the famous Sükrü Saracoglu this weekend, while Galatasaray host the club on the final day of the Turkish season. By then, however, it may already be too late to stop them. Tuncay Sanli lifted Middlesbrough from the gloom of their Premier League survival scrap by firing the Teesiders into the last eight of the FA Cup on Wednesday. 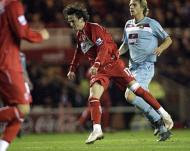 Tuncay's 20th-minute volley sealed a 2-0 win over West Ham after England midfielder Stewart Downing had given Boro an early lead in the 5th round replay at the Riverside. Boro's reward was a quarter-final trip to Everton and the outcome was never really in doubt against opponents who failed to live up to their recent form in the Premier League. Downing got Boro off to the perfect start with a superbly struck free-kick and Tuncay effectively settled the contest when centreback James Tomkins hooked a clearance into his path. Galatasaray to play with France's Bordeaux on Thursday! Galatasaray will play an UEFA Cup third round match with the Girondins De Bordeaux team of France in Istanbul on Thursday. The French team is expected to arrive in Istanbul on Tuesday evening. Galatasaray drew with Bordeaux 0-0 in its away match on February 18. Laurent Blanc, the coach of Girondins De Bordeaux, and Galatasaray's coach Bulent Korkmaz are expected to hold press conferences on Wednesday. Galatasaray soccer club, champion of last year's Turkish Turkcell Super league, officially signed an contract with Bulent Korkmaz. The 2.5-year contract includes an option for another year. The 40-year-old new coach replaced Michael Skibbe, who was dismissed after last week's defeat against Kocaelispor. 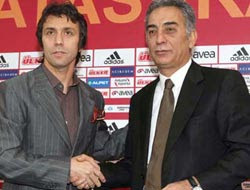 Korkmaz, who was a defender and captain of the Galatasaray, became the 52nd coach Galatasaray. But, what is so interesting is, that night, They offered the job for 13 weeks to former Galatasaray coach who was watching the disaster match Romanian Hagi ,first. And Bulent Korkmaz agreed to be the interim coach for Galatasaray team . Bulent Korkmaz who had a very short spell unsuccessfully coaching in the Turkish Turkcell Super League with Kayseri Erciyesspor and Genclerbirligi . He will have to report to Karl-Heinz Feldkamp who sit on top of the Galatasaray coaching department. AS I PREDICTED ON SUNDAY,GALATASARAY FIRES COACH SKIBBE!.. So, Galatasaray sacked coach Michael Skibbe on Monday a day after losing 5-2 to a last place team Kocaelispor in the Turkish Turkcell Super league. After drawing French team Bordo in the UEFA Cup match in France on this past Wednesday. The Cinderella team of Turkey, Sivasspor won their home match against Eskisehirspor who was desperate for points, with only one goal and stayed at top with 45 points all along at the end of the week 21nth. Sivasspor only goal came in the seventh minute by Frenchman Yannick Kamanan. Sivasspor's win became more important as three title contenders suffered heavy defeats on Saturday, and Sunday. Unlike last year, Sivasspor young rookie coach Bulent Uygun who does not have a experience in coaching said "We want to be the champions,""The beautiful people of Anatolia deserve beautiful things. They can do anything with limited resources and Sivasspor shows that." Sivasspor has been unbeaten in the last 10 games since Nov. 9, last year. If Sivasspor manages to defeat Fenerbahce in next weekend’s game, the gap will open up more on top. Until now, Sivasspor has been the underdog of winning the Turkcell Super League, but this weekend it proved to be a main contender. Also on Sunday in the early match Hacettepe beat Ankaraspor 3- 1, in Ankara. Galatasaray was beaten by Kocaelispor at home 2-5 in the closing game of the week. The game turned out the be a nightmare for Galatasaray after Milan Baros missed the penalty, the only chance to have a draw at the end of the game, which led to a counter-attack ending with another score for the guest team. The Kocaelispor hero was Taner Gulleri who blasted four of his team's five goals with Murat Hacioglu the other scorer. Galatasaray had taken the lead in the game through Mehmet Topal on 15 minutes with Cassio Lincoln the other scorer for Galatasaray. After the match, Galatasaray team officials had a emergency meeting and they said , "who ever is responsible for this disaster will be punished"
TURKEY SUPER LEAGUE SATURDAY WRAP!.. After a huge 7-0 win against Hacettepe last week, Fenerbahce lost 1-0 against Genclerbirligi and remained at 37 points. The last weekend most Lucky team become the worst team of the weekend!.. SOCCEROOS(Australian) midfielder Mile Jedinak Jediak gave Genclerbirligi the lead at 14th minute of the game, scoring the only goal in the match. Score-changing efforts of both the teams failed to bear fruits after this minute and the game ended at 1-0. After this score, Fenerbahce remained at fifth place. In the other games of Saturday, Denizlispor beat Trabzonspor 2-0 in the away match. Trabzonspor lost three important points for the title race after this score but kept its place with 42 points. I am talking about the Denzilispor coach Mesut Bakkal..
LIke Konyaspor the team who nead it a push up, in the standing,Ankaragücü, defeated Istanbul BB 2-1 in the away match and Kayserispor had a goalless draw with Bursaspor. The leader of Turkcell Super League, Sivasspor will play against Eskisehirspor at home and Galatasaray will face off Kocaelispor on Sunday’s action in the League. Also on Sunday, in the early match Hacettepe will gface Ankaraspor in Ankara. So, like Trabzonspor and Fenerbahce , Sivasspor might see a total different Eskisehirspor on Sunday!.. Let's not forget, next weekend Sivaspor will face Fenerbahce in Istanbul in the league match and the Fortis Turkish Cup match too. Lastly, Galatasaray, could capture the third place from Besiktas if they beat the second from bottom team Kocaelispor. Galatasaray's goalkeeper Morgan De Sanctis kicks the ball during their UEFA Cup soccer match at the Chaban Delmas stadium in Bordeaux February 18, 2009. Bordeaux and Galatasaray played to a stalemate in the first leg of their UEFA Cup last-32 clash but it was not for a lack of chances at either end. Both goalkeepers had to be on top form to keep the scoresheet clear, and it will have been be Gala that came away the happier side. Bordeaux were quickest out of the blocks with Yoann Gourcuff firing narrowly wide in the sixth minute. Galatasaray responded as Marouane Chamakh's long-range effort brought the first save out of Morgan de Sanctis. However, the hosts had the upper hand and Fernando Cavenaghi might have done better from Chamakh's cross but sent his effort over the bar. Former Lyon striker Milan Baros was back on familiar turf but could not find his range as he sent a shot over the bar from 25 yards in the 14th minute. He went much closer moments later, but Ulrich Rame made a fine save to turn his shot around the post. Cassio Lincoln then headed wide for Galatasaray in the 28th minute. Gourcuff was also off target with a long-range effort in the 35th minute, and that was the end of the chances before the break. The second half got off to a slow start, with another shot from range from Gourcuff flying wide in the only chance before the hour mark. The on-loan AC Milan, Galatasaray keeper man then forced De Sanctis into a sharp save from close range before Cavenaghi had a long-range effort blocked by Cassio. Cassio was then in action at the other end as his close-range effort brought another great save from Rame, who sent it wide for a corner. Galatasaray were enjoying their best spell of the game, and moments later Shabani Nonda had a shot that Rame could only push into the path of Sabri Sarioglu, but his follow-up effort went over the bar. Cassio then fired over the bar before play swung back to the other end where Gourcuff saw his shot charged down by Baris Ozbek. As time ran out, De Sanctis did well to block Fernando Menegazzo's close-range effort as the Galatasaray held on. FORTIS TURKISH CUP SEMI-FINAL DRAW!. First leg of the matches will be played on March 3rd, Fenerbahce will host league Leader Sivasspor in Istanbul and Besiktas will visit Ankaraspor in the first matches. Second leg of the Semi-Final matches will play on April 22th. The Final match will be on May 13th, 2009. Galatasaray will play 50th UEFA Cup match!.. Bordeaux defender Franck Jurietti knows his team have to earn a cushion from their UEFA Cup last 32 first-leg tie against Galatasaray if they are to go to Istanbul next week with any hope of progressing. Les Girondins host Galatasaray at the Stade Chaban-Delmas for the first match of what should be an evenly-contested double-header in the tournament's opening knockout round. Jurietti is fully aware of the hostile reception his team will receive in the second leg a week on Thursday so is urging them to make home advantage count on Wednesday. "It will definitely be a white-hot atmosphere (in Turkey). We have already experienced that,'' said the full-back. "So we will give our all to go over there in the best condition possible. We must win at home and not concede any goals. Bordeaux will restore Yoann Gourcuff to their line-up, the France playmaker having started on the bench in last weekend's 1-1 draw at home to Grenoble in Ligue 1. Forward David Bellion is a doubt with a groin injury. Les Girondins, who dropped into the UEFA Cup after finishing third in their Champions League group, have had a jaded look about them in recent weeks and have slipped down to fifth place in Ligue 1 after picking up only two points from their last three matches. Galatasaray have also struggled domestically of late - they have claimed just four points from four games since the winter break and have been knocked out of the Turkish Cup by Sivasspor. They should have winger Harry Kewell back from injury while play maker Lincoln returns from suspension after missing the 1-0 defeat to Antalyaspor at the weekend. Volkan Yaman (fractured thumb), Tobias Linderoth (groin) and Hakan Balta (thigh) are all doubts for Michael Skibbe's team. Galatasaray, winners of the competition back in 2000, are playing their 50th UEFA Cup fixture. 14 weeks to go, in the Turkcell Super League, this weekend ended in same way!.. We could add Besiktas as a loser too in this weekend! A win on Sunday against Trabzonspor would it turned around Besiktas team in the league!.. Unstable Besiktas, could not cash in the win at home against Trabzonspor!.. If you can't win the home matches , how are you going to play for Championship?.. When 26th week comes around this might be to late for Denizli, in my opinion!.. Like, other big two big guns of Istanbul, Galatasaray and Fenerbahce , Besiktas can't really shake them self's and win matches!.. Despite the luck draw in Bursa this weekend, without their star striker Mehmet Yildiz, still on top with 42 points . Trabzonspor who share the top spot with Sivasspor, is in different shoe than Sivasspor, in my opinion. After hiring Ersun Yanal as a new coach, they transferred 26 new players !.. Than this week, when Galatasaray got beat , Fenerbahce slashed Hacettepe with seven goals! TURKCELL SUPER LEAGUE WEEK 20,RESULTS..
TURKCELL SUPER LEAGUE SATURDAY WRAP..
GALATASARAY WENT DOWN AS FENERBAHCE EVENS THE POINTS WITH SCORING SEVEN GOALS! They scored seven unanswered goals ....Alex made hat trick and Turkish Striker Semih Senturk scored two goals..
Roberto Carlos and Deived also scored for Fenerbahce.. Politics and favoritism in this league , keeps teams like Hacettepe, Istanbul Buyuk sehir Belediye and Ankaraspor in this league!.. FENERBAHCE smashed seven goals past Hacettepe to climb level on points with Galatasaray, who lost ground on the leaders with a defeat away to Antalyaspor on Saturday. Hat-trick hero Alex got things started with two goals in the space of five minutes early in the match, and further strikes from Diego Lugano, Semih Senturk and Deivid de Souza made it 5-0 at the break. Fener were not done, though, and Senturk got his second soon after the re-start before Alex made the match ball his with a 58th-minute strike. It was a very different story for Galatasaray however as they went down to Ahmet Kuru's 59th-minute goal in Antalya, against Antalyaspor.. Both teams,Fenerbahce and Galatasaray are on 37 points, four behind Sivasspor and Trabzonspor who share the top spot in the Turkish Turkcell Super League..
Ankaragucu pulled themselves three points clear of the drop zone with a 3-1 win over Gaziantepspor. Silvino Joao Jaba and Murat Duruer scored in the final five minutes of the first half and, although Rodrigo Tabata scored a 49th-minute penalty for the visitors, Jaba's second in the 73rd minute locked up the points. Eskisehirspor and Genclerbirligi shared the points in a goalless score. Besiktas with a win here, could capture the third spot and surpass Galatasaray and Fenerbahce. Actually, Besiktas could do a favor to Galatasaray and Fenerbahce too.. If , Trabzonspor wins this match , Besiktas will pretty much will be out of top spot race. Sivasspor, has to win this match if they want to stay on top, just like Trabzonspor!.. In Denizli, Denizlispor will host Konyaspor, this is a must win match for Denzilispor if they lose this match, they could kiss good- bye this league , in my opinion. 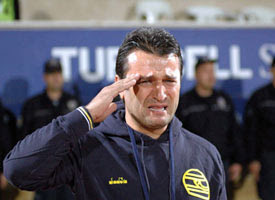 I think they made a huge mistake by firing their former coach Umit Kayihan. Lastly Kocaelispor will host a strong Kayserispor at home. FENERBAHCE IN THE WORLD'S RICHEST CLUBS TOP 20 LIST! Fenerbahce is the only team from Turkey made it to world's richest top 20 clubs in the world. Real Madrid is still the top moneymaking club in world football, beating out European Cup champion Manchester United due to the plunging pound, according to the latest review of the sport’s finances. Deloitte’s study, which ranks the 20 biggest clubs based on revenue, showed that Madrid generated Euro365.8 million in the 12 months to June 30, 2008. 19th-place Fenerbahce is the first Turkish club to appear since the list was created after the 1996-97 season. 1. Real Madrid, Spain, Euro365.8 million. 2. Manchester United, England, Euro324.8 million. 3. Barcelona, Spain, Euro308.8 million. 4. Bayern Munich, Germany, Euro295.3 million. 5. Chelsea, England, Euro268.9 million. 6. Arsenal, England, Euro264.4 million. 7. Liverpool, England, Euro210.9 million. 8. AC Milan, Italy, Euro209.5 million. 9. AS Roma, Italy, Euro175.4 million. 10. Inter Milan, Italy, Euro172.9 million. 11. Juventus, Italy, Euro167.5 million. 12. Lyon, France, Euro155.7 million. 13. Schalke, Germany, Euro148.4 million. 14. Tottenham, England, Euro145 million. 15. Hamburg, Germany, Euro127.9 million. 16. Marseille, France, Euro126.8 million. 17. Newcastle, England, Euro125.6 million. 18. Stuggart, Germany, Euro111.5 million. 19. Fenerbahce, Turkey, Euro111.3 million. 20. Manchester City, England, Euro104 million. TURKEY 1 IVORY COAST I- DROGBA SCORES IN THE LAST MINUTE! Turkish National team players and the team head coach Fatih Terim, forget the soccer match is full ninety minutes and it does not finish until that last whistle!.. A mistake by midfield and than defense, gave Drogba's goal to tie the match 1-1. For International friendly match it was a good fast pace match..
That is why Izmir Ataturk Stadium was filled with Izmir soccer fans on Wednesday night!.. This was the last friendly match for Turkish National Team before the big match against Spain in March. Lack of Consistency and team discipline will be big issue for Fatih Terim ,in my opinion. Turkey: Volkan Demirel, Gokhan Gonul (Mehmet Yildiz, 73), Servet Cetin, Gokhan Zan, Caner Erkin, Hamit Altintop (Ayhan Akman, 62), Mehmet Aurelio, Arda Turan (Kazim Kazim, 45), Tuncay Sanli (Emre Belozoglu, 45), Semih Senturk (Sabri Sarioglu, 45), Gokhan Unal (Halil Altintop, 64). Ivory Coast: Boubacar Barry, Arthur Boka, Didier Zokora (Boubacar Sanogo, 73), Emmanuel Eboue, Yaya Toure, Kolo Toure, Emerse Fae (Jean Jacques Gosso, 60), Didier Drogba, Koffi Romaric, Steven Lohore Gohouri (Souleymane Bamba, 85), Guy Demel (Abdulkader Keita, 45). Turkey will host Ivory Coast in friendly match..
Turkish national soccer team will host Ivory Coast in a friendly on Wednesday aheadd of 2010 World Cup group matches with group leaders Spain. Turkey and Ivory Coast will face each other for the first time in history. Ivory Coast will be Turkey's first opponent this year. The match will take place in the Aegean city of Izmir's Ataturk Stadium at 8:30 p.m(local time). Romania's Sorin Corpodean will referee next week's match which will be the first encounter of the two national teams. Chelsea striker Didier Drogba will appear for the first time over the past one year with Ivorians after having injury problems. Ivory Coast coach Vahid Halilhodzic, former coach of Trabzonspor, also named Arsenal's Kolo Toure and Emmanuel Eboue and Tottenham Hotspur midfielder Didier Zokora in the squad. Turkey coach Fatih Terim named his squad as goalkeepers Ufuk Ceylan (Manisaspor) and Volkan Demirel (Fenerbahce); defenders Gokhan Gonul (Fenerbahce), Sabri Sarioglu, Servet Cetin (Galatasaray), Ibrahim Kas (Getafe), Eren Gungor (Kayserispor), Gokhan Zan (Besiktas), Caner Erkin (CSKA Moscow); midfielders Hamit Altintop (Bayern Münich), Kazim Kazim, Emre Belozoglu (Fenerbahce), Ayhan Akman, Arda Turan (Galatasaray), Mehmet Aurelio (Real Betis), Nuri Sahin (Borussia Dortmund), Tuncay Sanlı (Middlesbrough); and strikers Halil Altintop (Schalke 04), Semih Senturk (Fenerbahce), Gokhan Unal (Trabzonspor), Mehmet Yildiz (Sivasspor). Turkey will face Spain, defending European champions, in an away match on March 28 and and in a return match on April 1. Spain are the leaders in 2010 FIFA World Cup qualifying Group 5 with 12 points. Turkey follow Spain with 8 points after four group matches. Fenerbahce could not beat nor score a goal, on ten man, Istanbul Buyuksehir Team. In th other matches on Sunday, Antalyaspor beat Denizlispor 2-1, Gaziantepspor beat Ankaraspor at home with two goals, and Bursaspor won in away match against Genclerbirligi in Ankara 2-1. Sivasspor moved back into shared first place after beating Kocaelispor 2-0 on Saturday. Sivasspor new goal scorer Frenchman Yanick Kamanan score the first goal in the 17th minute and Israeli Pini Balili netted the second goal for Sivasspor. Galatasaray dropped two important points in a 1-1 draw with Kayserispor. Nonda did put Galatasaray ahead on 27 minutes but Kayserispor's Mehmet Eren scored a dramatic and last-minute goal to make it 1-1.
place spot with 37 points. the end of this weekend. Fenerbahce qualified for the semi-finals of the Fortis Turkish Cup by beating Bursaspor. Fenerbahce captain Alex de Souza scored two and Spanish international player Daniel Guiza scored one . Bursaspor only goal came by Ibrahim Kirita in the last minutes of the match. 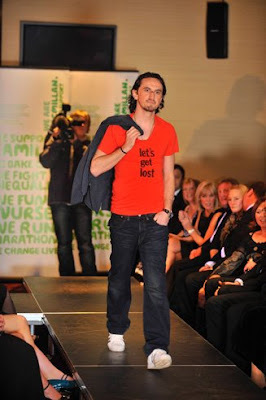 Boro player Tuncay Sanli and the other Boro players, took the stage walk way when the club hosted a charity fashion event at the Riverside Stadium last night. Germany coach Joachim Low has awarded first international call-ups to Mesut Ozil and 21-man squad to face Norway in a friendly next Wednesday. Ozil has recently committed himself to the Germany national team despite advances from Turkey, who he would also be eligible to represent. Should he earn his first cap next Wednesday, he would officially only be able to represent Germany in future and Low is ready to hand him that after a chat last Friday. "The Turkish Football Association have been trying hard to get him recently and we decided to sit back for a while until he decided whether he wanted to play for the Germany national team," said Low. "In a telephone conversation last Friday, he told me that he wants to play for our team in future. "That made it only obvious that we would nominate him in the squad for the Norway game." Werder Bremen midfielder Ozil was born in Germany and is the third generation of a Turkish family that settled in the country. He said it had been difficult "because my family and many of my friends come from Turkey," but he feels he has "made the right decision". He added: "This is not a decision against my Turkish roots. I am delighted to be called up and will look to take my chance with the Germany national team." UMIT KAYIHAN IS THE LAST VICTIM TO GET AXED IN THE TURKISH TURKCELL SUPER LEAGUE! Denizlispor coach Umit Kayihan who came in in the 10th week ,was sacked on Thursday after losing the Turkish Cup match against Ankaraspor. The other 9 teams in the Tukcell Super League start the season and continued with their current coaches . Spaniard Luis Aragones at Fenerbahce and Galatasaray in Michael Skibbe, are the only two foriegn coaches in the Turkish Turkcell Super League. After Sivasspor advanced to the Turkish Fortis Cup Ankaraspor and Besiktas have secured a spot in the semi finals of the Fortis Turkish Cup. Ankaraspor beat Denizlispor at home in the second leg match 2-1 while Besiktas demolished Antalyaspor 3-1 in Istanbul. The last ticket match will be between Bursaspor and Fenerbahce in Bursa, on Thursday night. Besiktas were on right track after last week's 0-2 win in Antalya and added a 3-1 home victory to advanced to the semi-finals. Besiktas goals came from Bobo, Ibrahim Üzülmez and Serdar Özkan, and Antalyaspor's goal was scored by Ahmet Kuru. SIVASPOR ELIMINATES GALATASARAY FROM THE FORTIS CUP! Galatasaray, scored the first goal in 9th minute of the match by Arda Turan. Sivaspor tied the match in the 30th minute by their new player from France, Yannick Kamanan. saved the day, for Sivasspor. This team eliminate Galatasaray and this team is on top of the Turkish Super League!.. He blew it for Sivaspor in my opinion!.. I hope, Turkish Football Federation and Sivasspor fine this absurd soccer player. Schalke release Ernst and will sign with Besiktas!.. They are getting someone's garbage where there is a lot of player in this position!.. This will be the most expensive transfer in the Besiktas team. and he will be the most money earner in Besiktas team. Besiktas will pay transfer fee close to 4.5 million euros to Schalke team and 5.5 million euros to the player for 2.5 years. Who is Fabian Ernst ?.. Fabian Ernst (born 30 May 1979 in Hannover) is a German footballer. He started his career with Hannover 96. From 1998 to 2000 he played for Hamburger SV in the Bundesliga, playing in 48 games, but scoring no goals. The midfielder turned then to Werder Bremen. In 152 games in the Bundesliga he scored 11 goals. 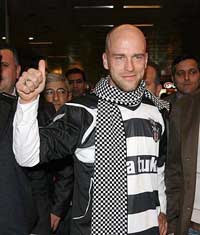 He left after spending three and a half year at Schalke and joined Besiktas JK. The player signed a contract which will last until 2012. TURKCELL SUPER LEAGUE SUNDAY WRAP.. This was the match that Fenerbahce could it closed the gap on top. But, after another draw at home back to back they have lost big grounds in the catching up game!.. Fenerbahce was held by Gazinatepsor on Sunday and almost loss the match, thanks to Alex's late goal. Gaziantepspor were close to winning this game as Erman Ozgur put the Gaziantep team ahead with just eight minutes left in regular time. Fenerbahce title hopes is little bit dented by a rather disappointing 1-1 draw with Gaziantepspor in Istanbul. But, Besiktas won the match with Tello's beituful goal. In the other matches on Sunday, Eskishehirspor trashed Istanbul B.B 6-1 at home and Konyaspor won their must win match in Ankara against Ankaragucu 3-1 .